Some of you might have noticed that we like to eat. For a lot of people, eating is something they do to stay alive. They call it a necessity. But for us, eating is a hobby. Uncle Sammy’s: Our first night in Chicago, we were having a horrible time finding a place to park a UHaul truck. At about midnight, we finally found a place and were walking home when we stumbled onto this gem. The Pilgrim is a very fine sandwich. Kitchen Sink: Good, simple sandwiches. Floriole: Adrienne loved it. I thought it was only OK. Quiche, apparently, is to die for. Pasta Bowl: Delicious and affordable pasta. Tzatziki Grill: Excellent Greek place that also has a pretty solid Italian Beef sandwich. 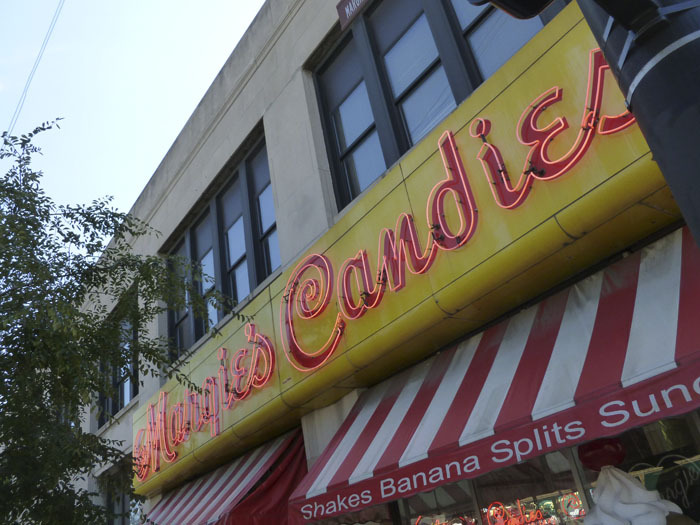 Margie’s Candies: It’s like time travel at Margie’s. Egg-salad sandwich and the Terrapin Sundae: Recommended. Lou Malnati’s Pizzeria: Our favorite pizza in Chicago so far. Pizza in Chicago is like barbecue in other towns: Everyone has a very strong opinion. We loved Lou’s, but we’re still open to trying others. Lito’s Empanadas: Delicious — and cheap. For $2.50, one of these little guys is great for a snack. Get two, and it’s lunch. Del Seoul: Weird little Asian dumplings that are oddly addictive. Paciugo: Gelato. Can’t go wrong with gelato. Pret a Manger: This is Target’s cafe. Yes, I know. Why eat out at Target? But you see, here in Chicago, even going to Target is a dining experience. Brown’s Chicken: Fried chicken place in one of the downtown pedways. Scenery wasn’t great, but loved the biscuits and mashed potatoes. 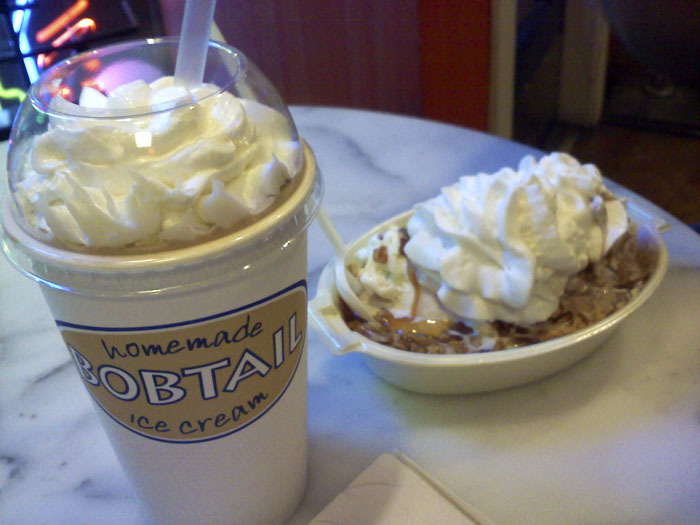 Bobtail Ice Cream: An almost-overwhelming amount of goodness. The Grove: More time travel. Open-face turkey or meatloaf sandwich, with bottomless coffee. Red Hen Bread: Tip: Get the day-old stuff for a little less money (same deliciousness, though). Taco Joint: Best Mexican so far in Chicago. Lebanese Pork Taco: must have (available only on Thursdays). Chicago’s Dog House: Our favorite dog place in Chicago so far. Good choices, good service, good prices. Clark Street Dog: Got caught in a storm and waited it out in here with a couple of dogs and a couple of beers. There are worse places to end up when it’s raining. Red Hot Ranch: Our first hot dogs in Chicago. Our first experience with french fries on a hot dog. Interesting. Big Star: Gourmet tacos. Service was only OK, but the decor was great. After Taco Joint, though, hard to compare. Filini: Ultra-modern, ultra-hip dining at the signature downtown building Aqua. Sotto Bosco pizza was impressive. As was the Carciofini spinach dip. Rosebud: Best Italian so far in Chicago. Two must-tries: Penne Bolognese and their Cavatelli Alla Rosebud. Toast: Great service. Outstanding breakfast burrito. 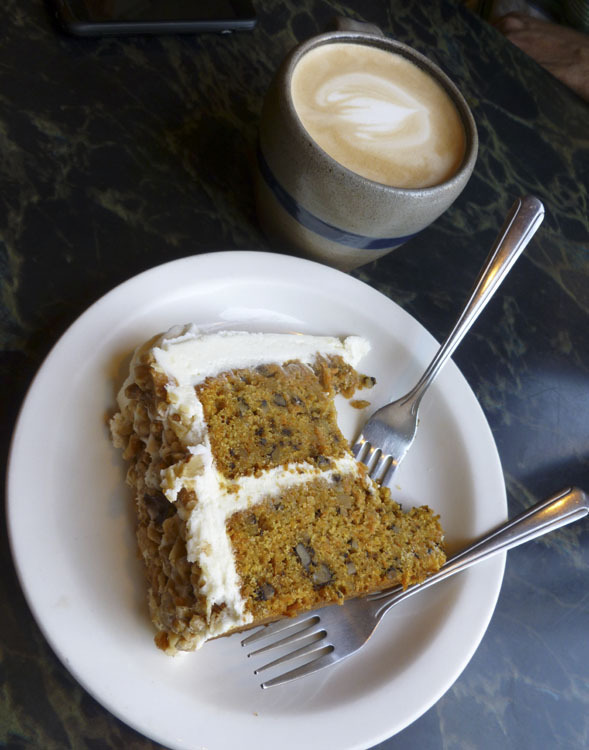 The Bourgeois Pig Cafe: Carrot cake! Goose Island Brewpub: We didn’t eat here, but for some great local brews, it’s worth a try. Dunlays on Clark: $5 Cheeseburger special = delicious. 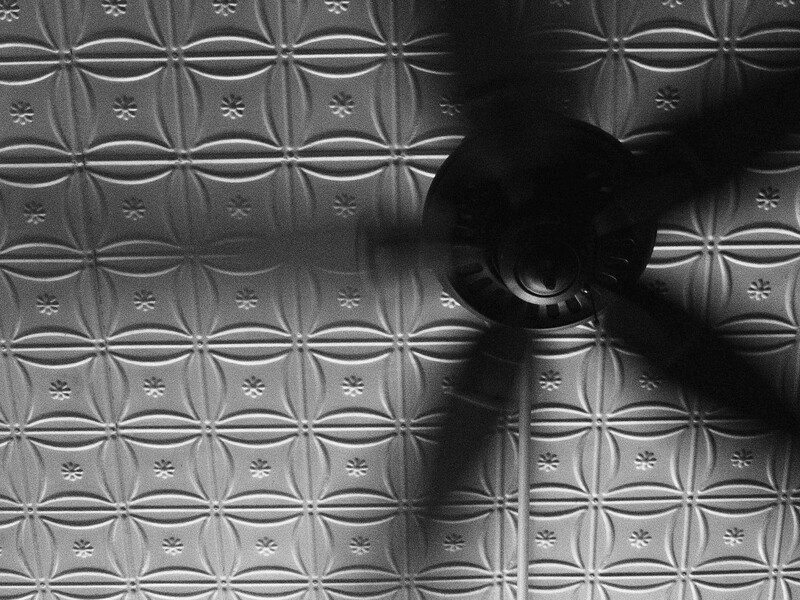 The Burwood Tap: One of the oldest continuously operating bars in Chicago. Really good free food Mondays through Thursdays (my fave was the chicken). Smoque: Been having a hard time finding some barbecue out here, but this was fantastic. Pizzeria Due: After a too-long wait at Malnati’s, we ended up here. Not quite as good as Lou Malnati’s, but if LMs is a 10, Pizzeria Due is a 9. Very good. Portillo’s: Iconic. Worth it for the atmosphere. Still, Chicago’s Dog House wins out. Potbelly Sandwich Shop: Grilled Chicken Mediterranean is a fine, fine sandwich. Matisse: Did not expect deliciousness when we ordered the Reuben Potstickers. We were pleasantly surprised. Do-Rite Donuts: You’ll find lots of Dunkin’ Donuts here, but few local places. These guys do donuts right. Wow Bao: Quirky little place with neat little fluffy dumplings. A must-try. 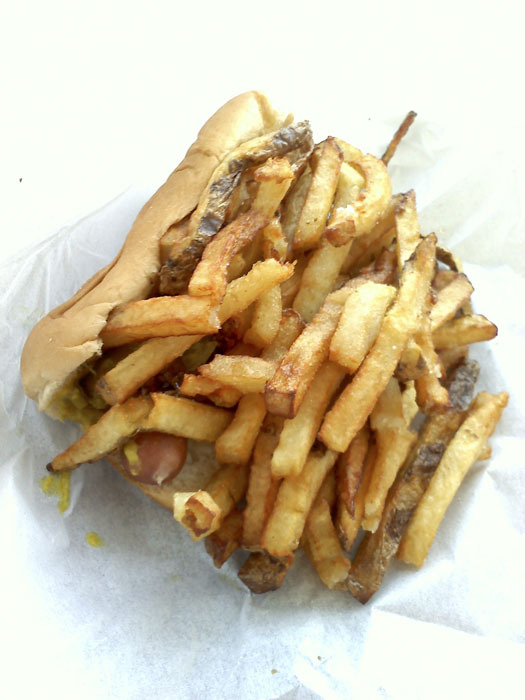 Devil Dawgs: It’s worthwhile to try all of Chicago’s hot dogs. So much food in this town — how do people here ever get anything done? Sundaes, treats, floats. Plenty of tasty options at Margie's Candies. If you're after treats, Bobtail is also an excellent choice. What's this? A hot dog? Yes, I guess so. Underneath the french fries, anyway. Interesting technique, Red Hot Ranch. 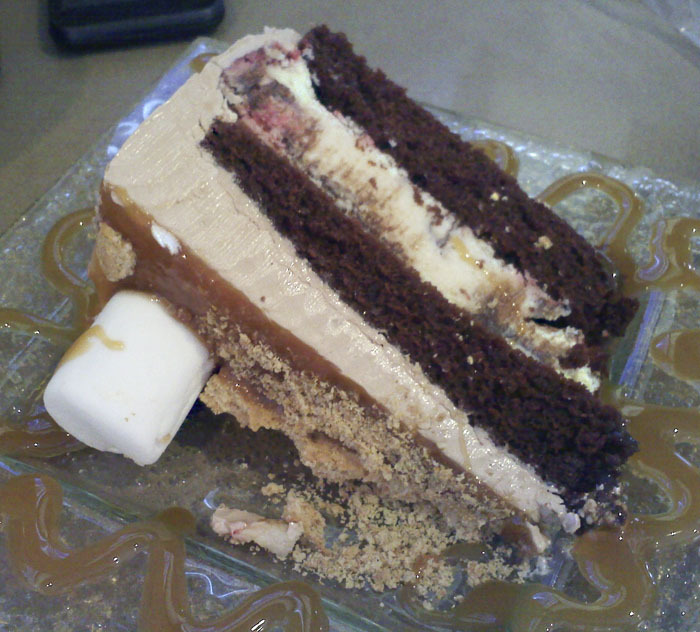 The S'mores cake at The Edge. Cake did not last long. 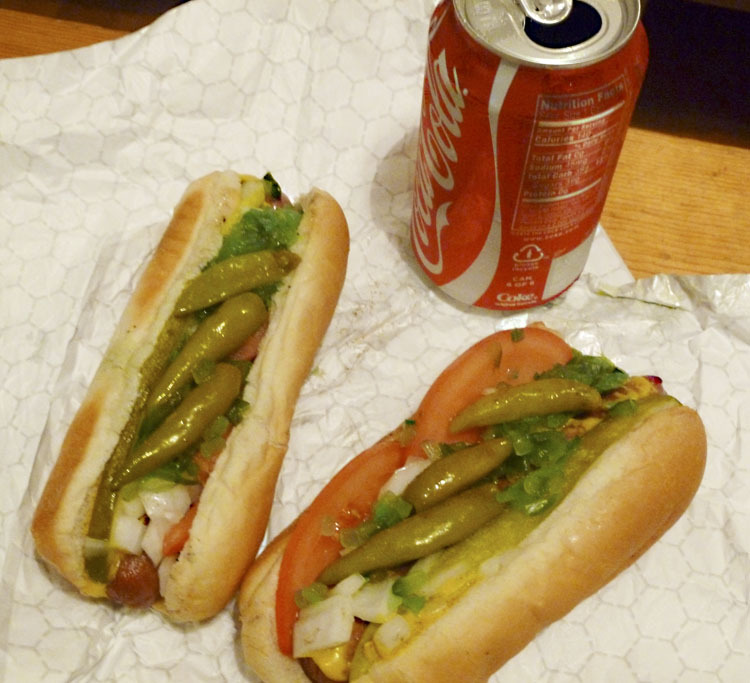 The best Chicago hot dogs, in our opinion. Chicago's Dog House. 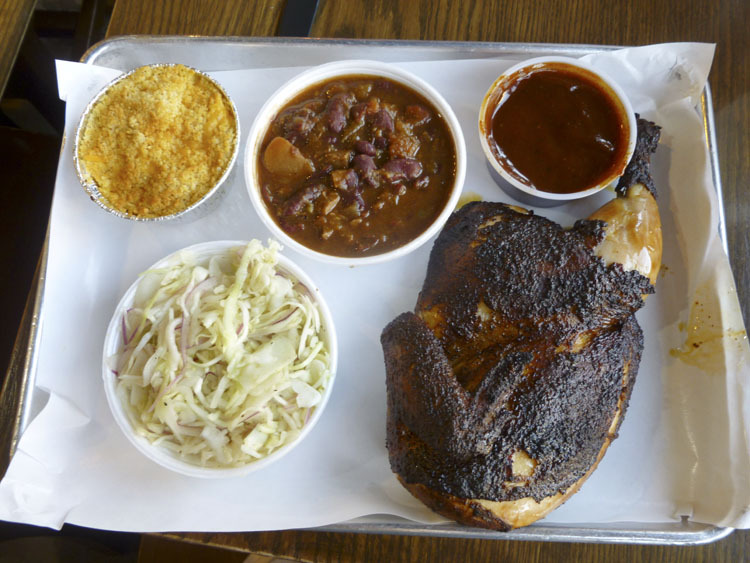 A very full meal at Smoque BBQ: Chicken, mac & cheese, baked beans, and cole slaw. Carrot Cake! At the Bourgeois Pig. We don't only take pictures of food. We are also capital-A Artists. Or, maybe this is the view after we'd eaten too much and had to lay on the floor. Hard to say. 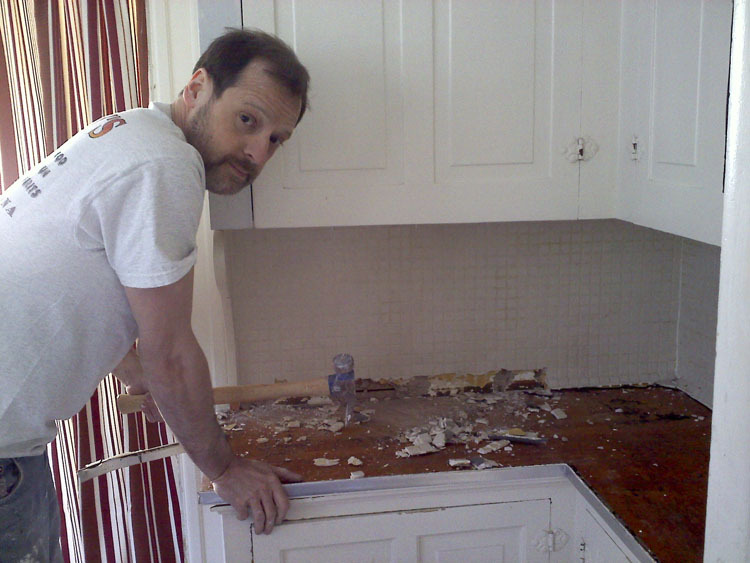 The kitchen was in pretty rough shape when we bought our house in Colorado Springs. 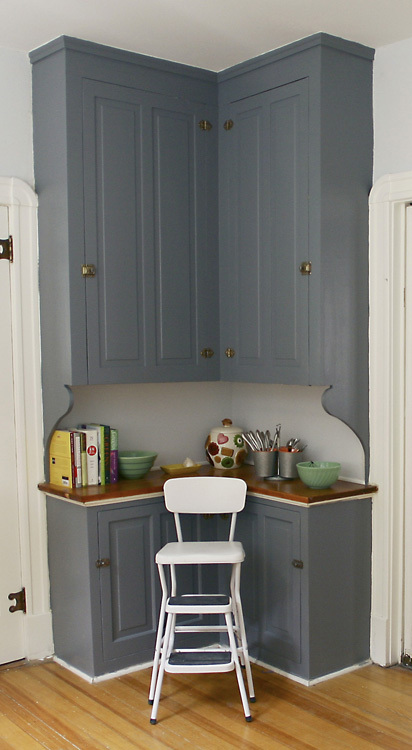 Cool metal cabinets painted with not-cool almond housepaint. 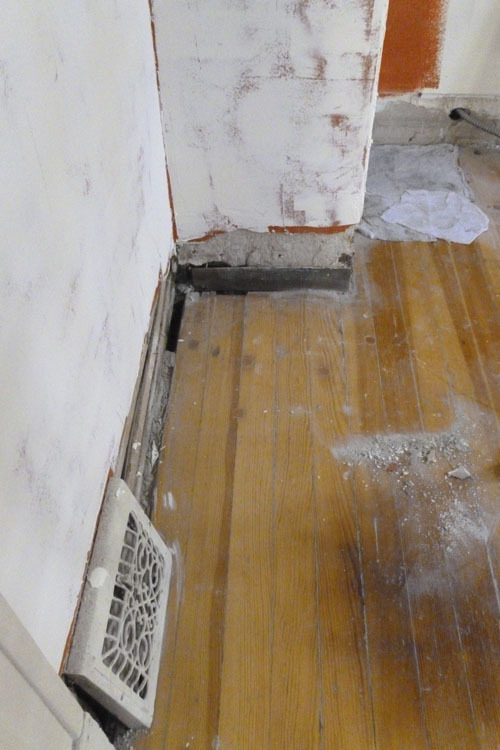 With fancy plywood baseboards. 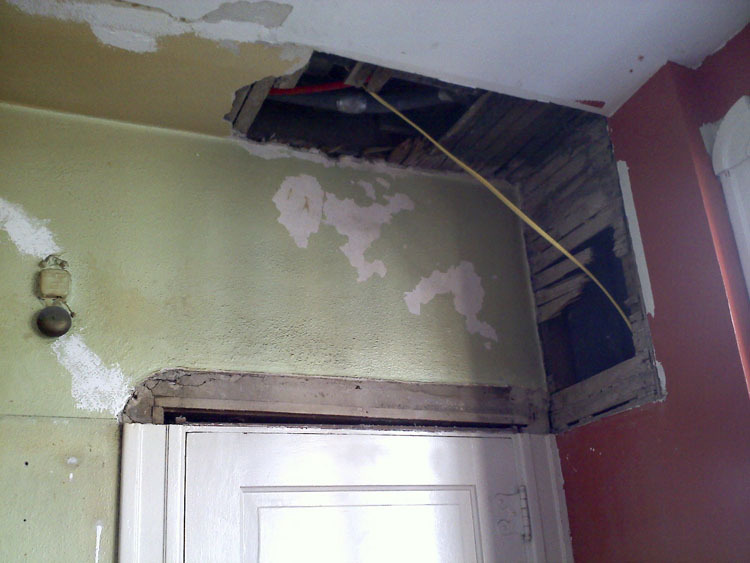 We bought our house as a HUD foreclosure in early 2011, and it had some issues. The kitchen was kind of a mess. It didn’t have any appliances except for the dishwasher. 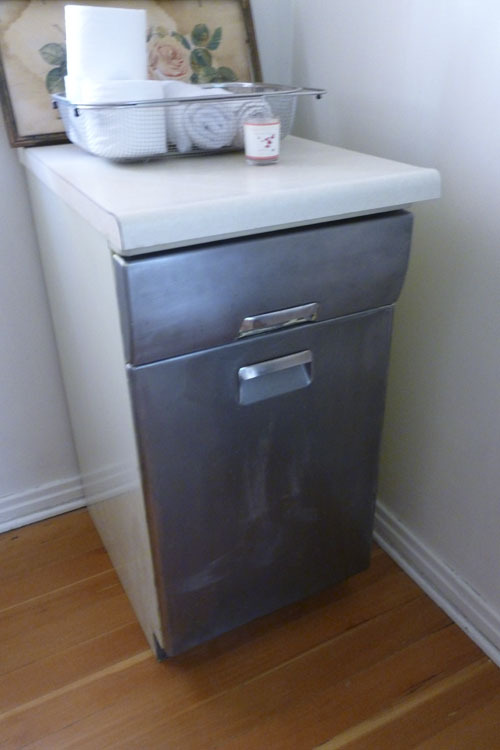 It had some old metal cabinets that had been painted with house paint. Junky baseboards, crappy laminate countertop, particleboard “backsplash,” peeling lead-based paint and terribly uneven wall texture. 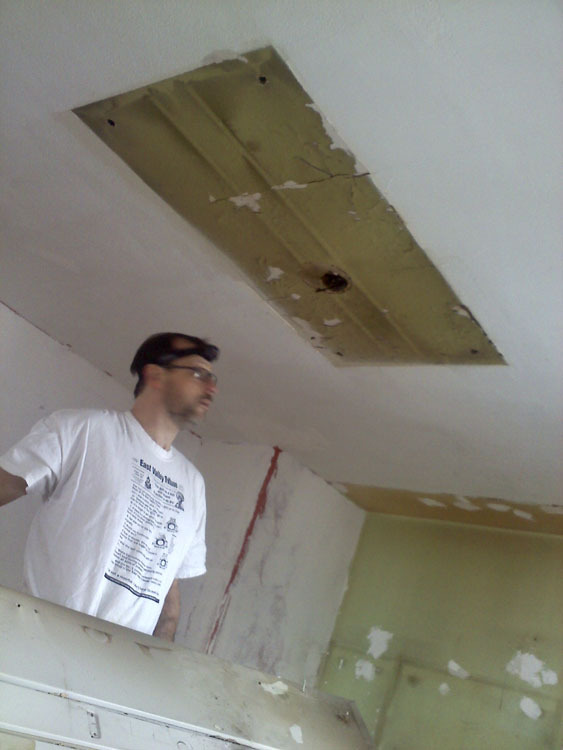 Oh, and a huge hole in the ceiling from a leak that had been fixed, but not patched. Although Mike was a little intimidated by this whole scene, I was happy. 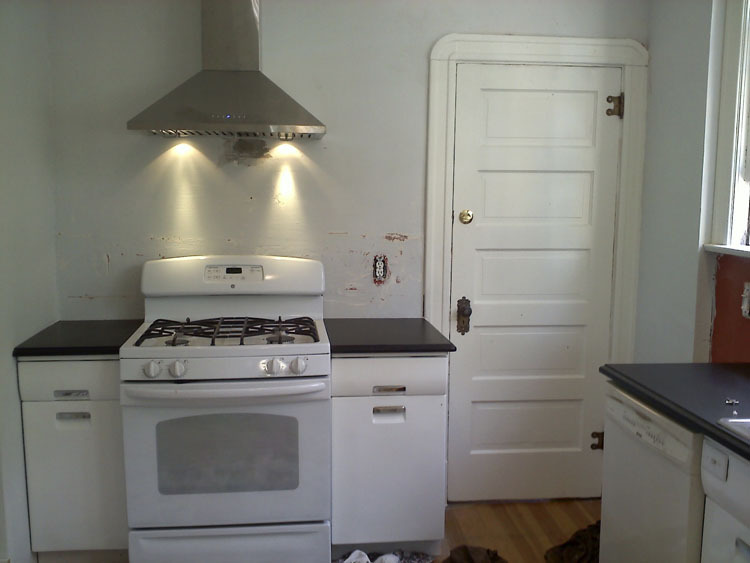 I wanted a new kitchen done my way, not a new kitchen that someone else had done to their taste. I thought we’d probably rip the whole thing out and start all over. We had planned to redo it over time — which we figured would be within about a year of living there. We had spent most of our original budget on other things, like gutters and other repairs. So we only had about $4,000 left, and that wasn’t even close to what we thought we needed. We needed time to save more money and to really figure out what we wanted in there. We thought we’d have some custom cabinets and countertops made to match the original ones that were still there (and our next door neighbor’s — who had 90% of her original kitchen still intact). We also wanted to incorporate this cool vintage stove we got. Beyond that, we didn’t have too many ideas upfront. But when Mike got laid off in December 2011, we decided that we should either rent or sell the house, and the current kitchen was not going to cut it for either of those scenarios. We still only had $4,000, and were really not inclined to do too much custom work since we weren’t going to live there. But we really wanted a custom look, and we wanted it to look nice. In order to get our loan, the bank made us put money into a special account and make certain repairs within two weeks of closing escrow. One of those things was to fix the ceiling and paint the kitchen. 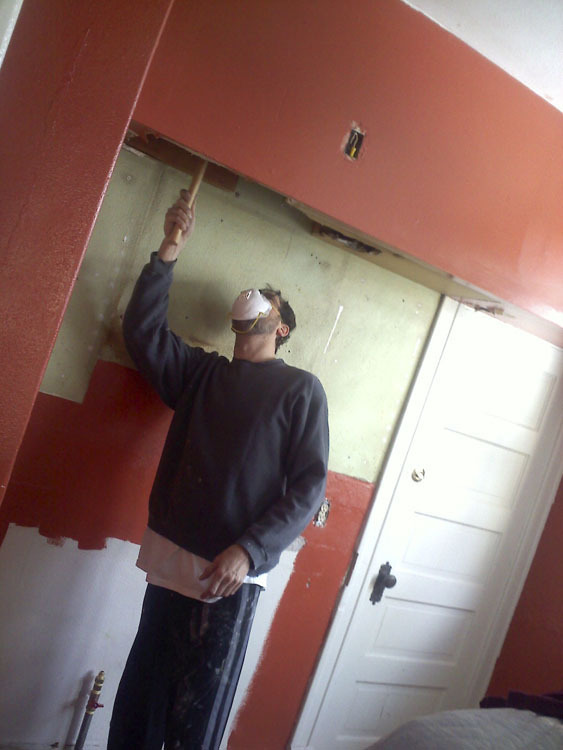 We thought we were going to take the whole ceiling down (along with the walls) because the texture was so uneven at some point, so we wanted to just do a quick and cheap fix for the bank loan. 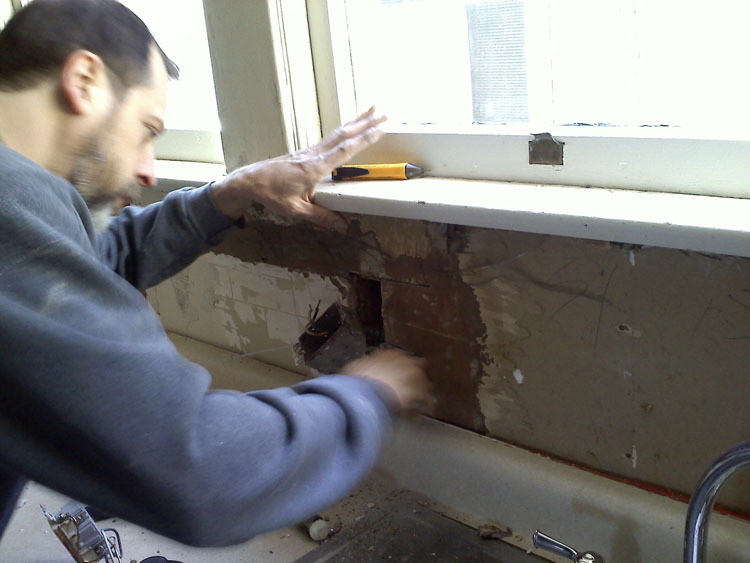 In order to save money, Mike evened out the jaggedy holes so the drywall guy could just do a quick and dirty patch job to satisfy the bank. 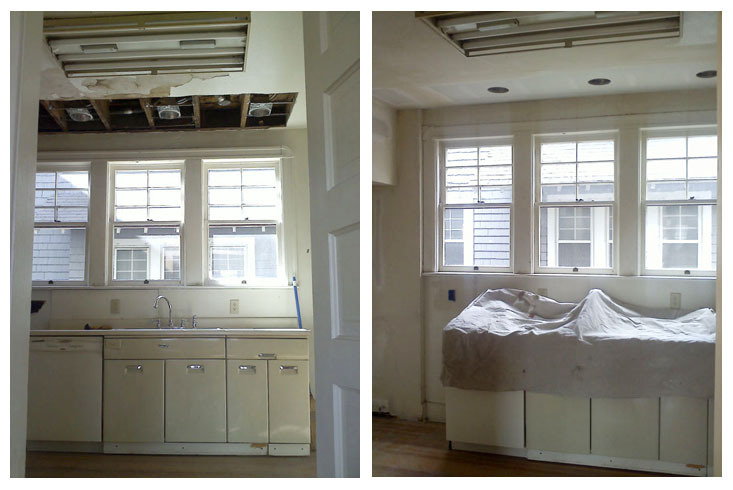 While we had the ceiling open, we had an electrician come in and add some recessed lighting above the sink. We also thought we’d paint it in something fun like orange or red, just temporarily! 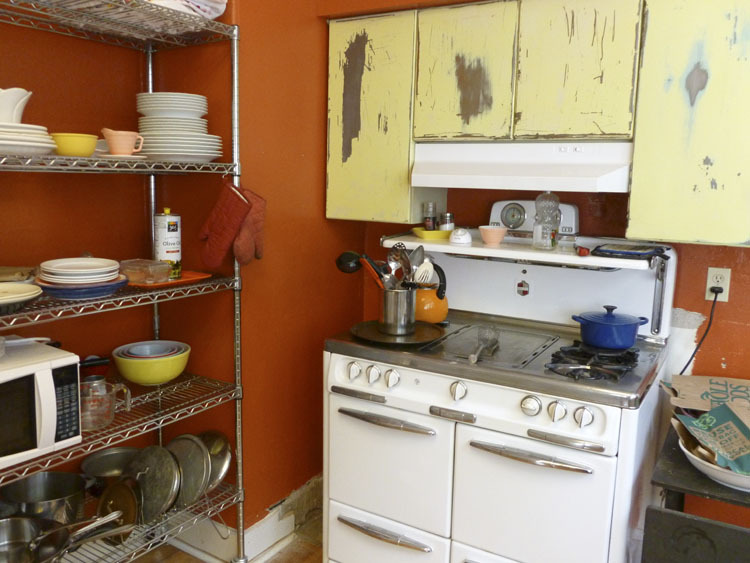 And we had the brilliant idea to try to strip the paint off the cabinets and get down to bare metal for a sort-of industrial look. None one of those ideas worked out too well. The whole lipstick on a pig thing, I guess. 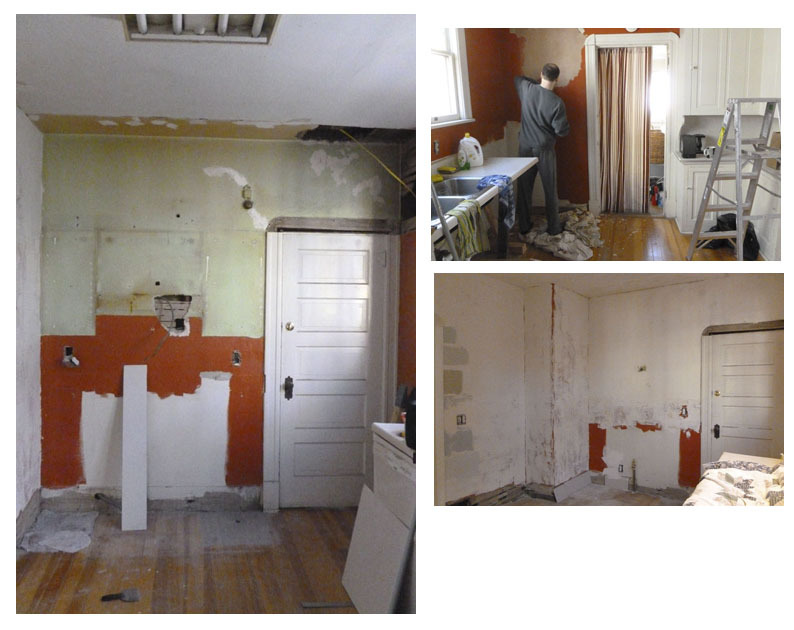 We lived with the sloppy red paint, the ill-fitting stove, and the half-stripped cabinets for months, and probably would have for a lot longer if we weren’t forced to renovate. There's more than one way to strip a cabinet. Unfortunately, neither the sander nor the copious application of Jasco worked well on ours unless we were willing to devote most of the next six months to the project. Both methods got the house paint off, but not the baked-on original factory finish. Yay, now we have half-stripped yellow cabinets. But check out how cool they would have looked! My dad did this one, he is a lot more patient than we are. Next up was choosing a paint color. Fun. 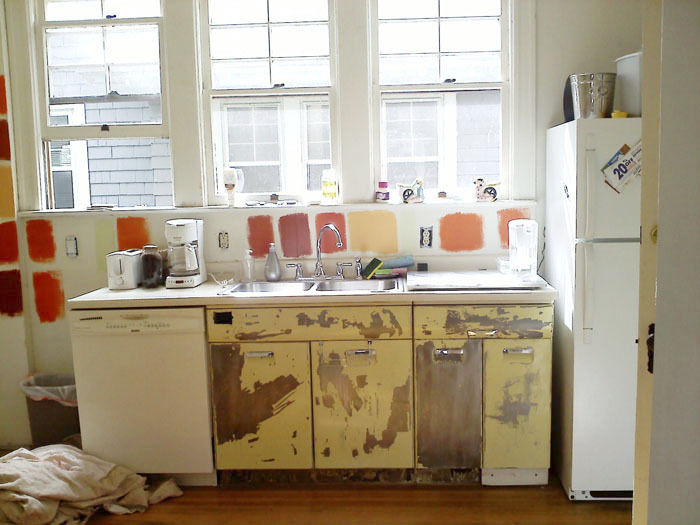 Which color goes best with half-stripped yellow-metal cabinets? I don't remember exactly what we were thinking with this, except maybe "it's only temporary!" 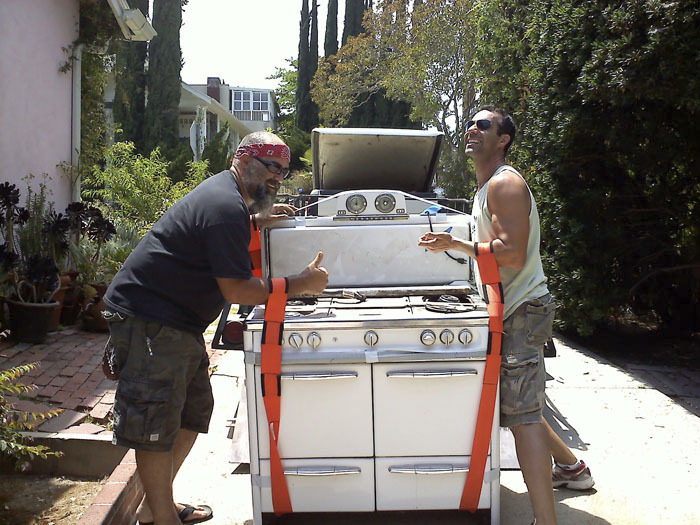 My brothers helping me ship the cool vintage stove from L.A. They were happy to do it! 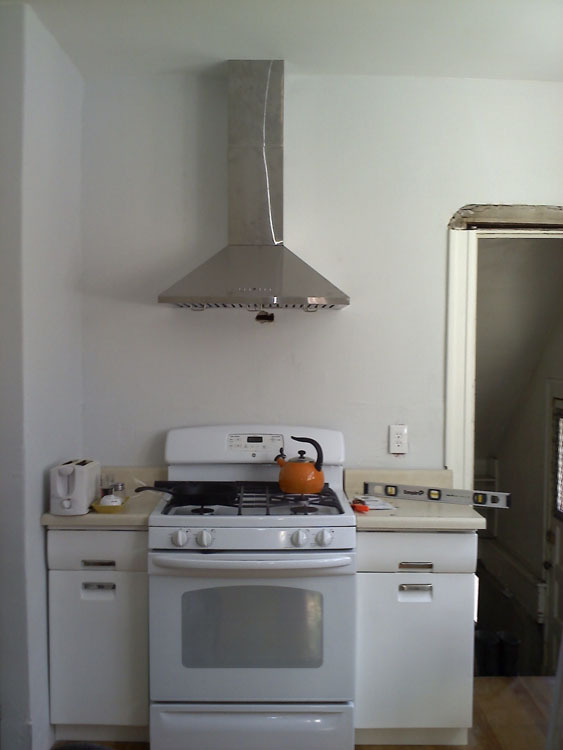 The stove was too big to fit between the bottom cabinets. But anyway, Ta-Da! Our awesome temporary kitchen. And also: Orange! 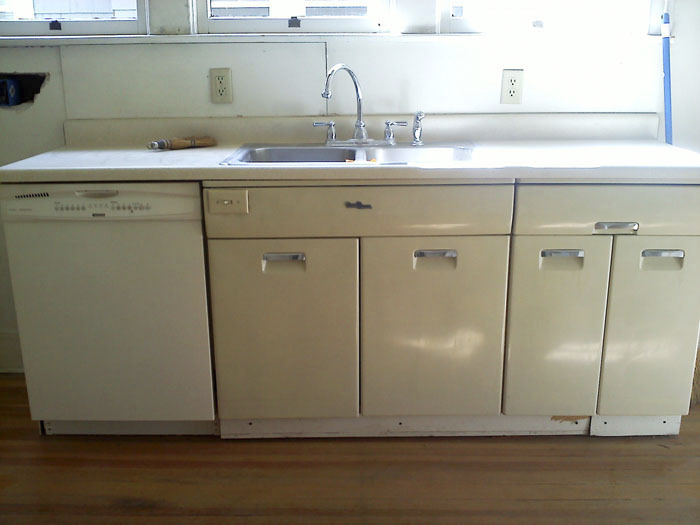 Oh yea, here's the original kitchen hutch we wanted to copy for the rest of the cabinets. Even though it needed work, I did make it look pretty cute for my photography sessions! 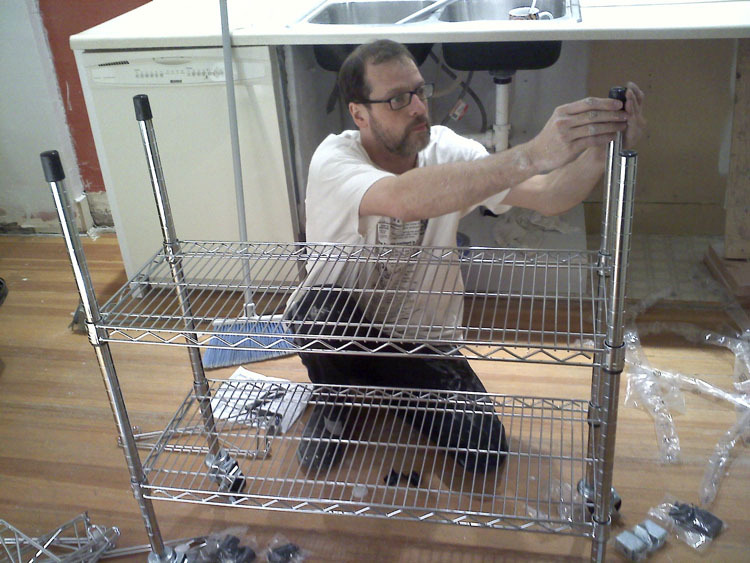 Ok, So, it becomes December and Mike gets laid off and we have to get serious about this kitchen! We developed a plan. We would try and reuse the cabinets. They were in really good condition mechanically, and kind of cool and unique (and according to Google, can be pretty valuable) and since they were metal they could be stripped and powder coated, which as it turns out, is a pretty eco-friendly way of coating things. Plus we’d save a lot of money not having to get new cabinets, and we’d help save the Earth by reusing them. We searched high and low and finally found Industrialex in Colorado Springs who would strip and powder coat them for a really good price. I’m not really sure how they stripped them, but I think it was some kind of blasting. Probably bead blasting or a gentle type of sandblasting? 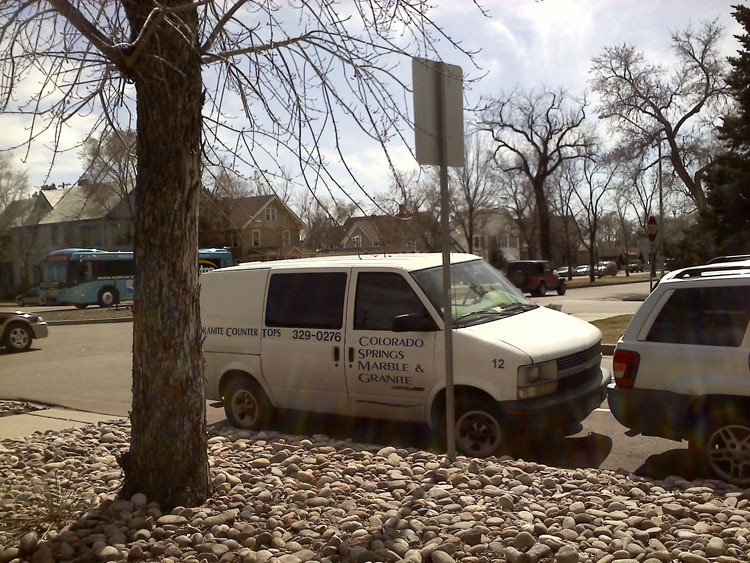 Their website isn’t that great, but they’re located at 171 Talamine Court, Colorado Springs, CO 80907 so if you need something powder coated just go over there and they’ll help you out. We did have to take them out (for the second time) and haul them over there but Industrialex delivered them to us when they were done. At this point we resigned ourselves to not being able to make that cool old stove fit in our space, so we bought a brand new stove that was a standard size. The powder coating process coats the entire thing, inside and out, making it all look brand new. 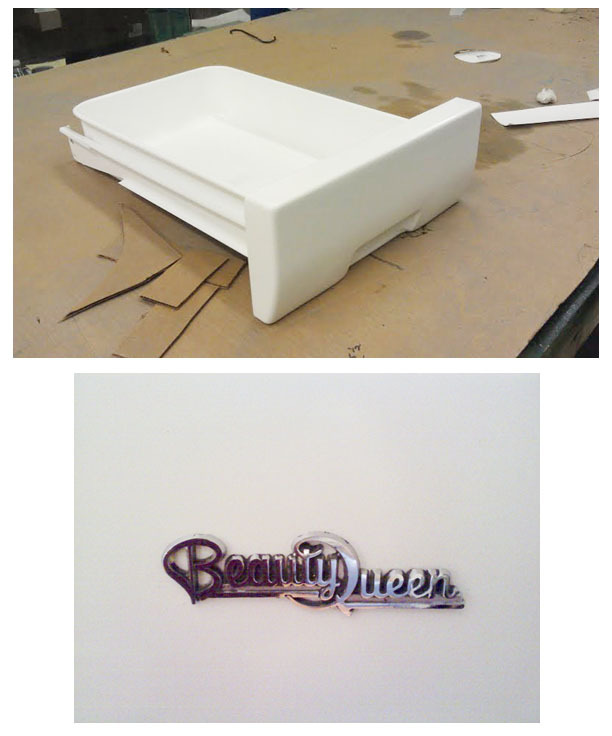 We also polished the original Beauty Queen logo and put it back on. This white metal looks really sharp. 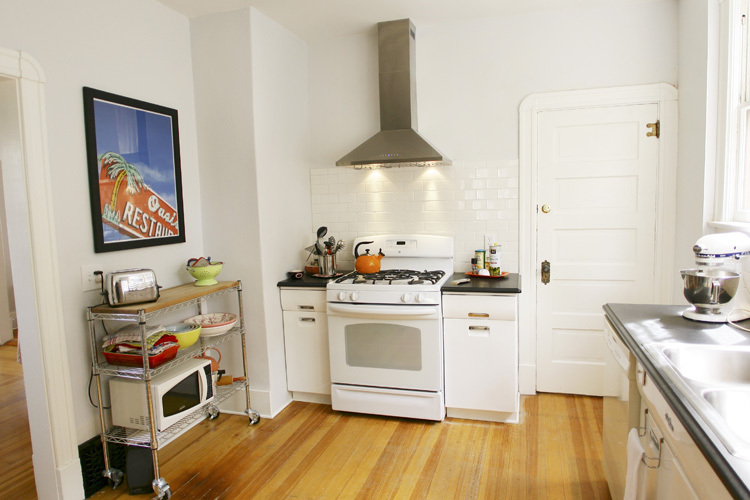 Since we were now going for resale, we wanted a pretty generic kitchen, but with some trendy style. 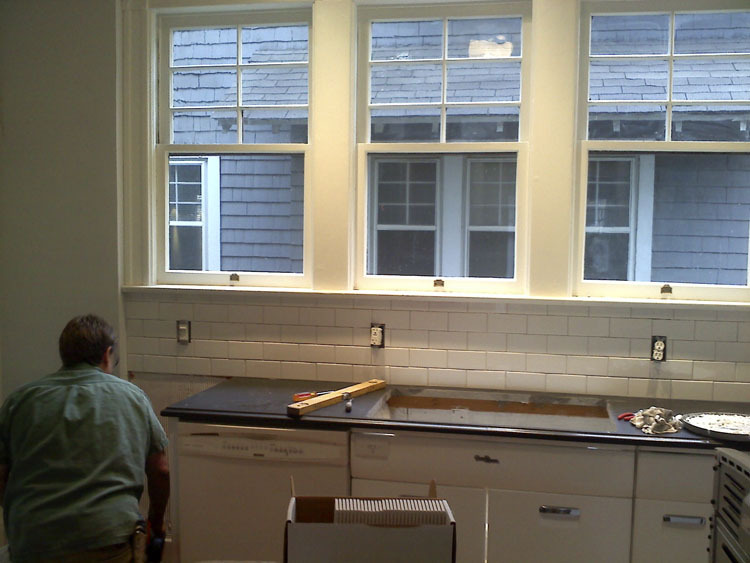 We did the white on the cabinets and chose white subway tile for the backsplash. We didn’t have much of an idea on countertops, so we spent a week visiting about 20 different local stores, show rooms, and stone yards, as well as Lowe’s and Home Depot. There are tons of different countertop options! I have always loved marble (way too expensive for this project) and also really liked the science lab look with the soapstone countertops. 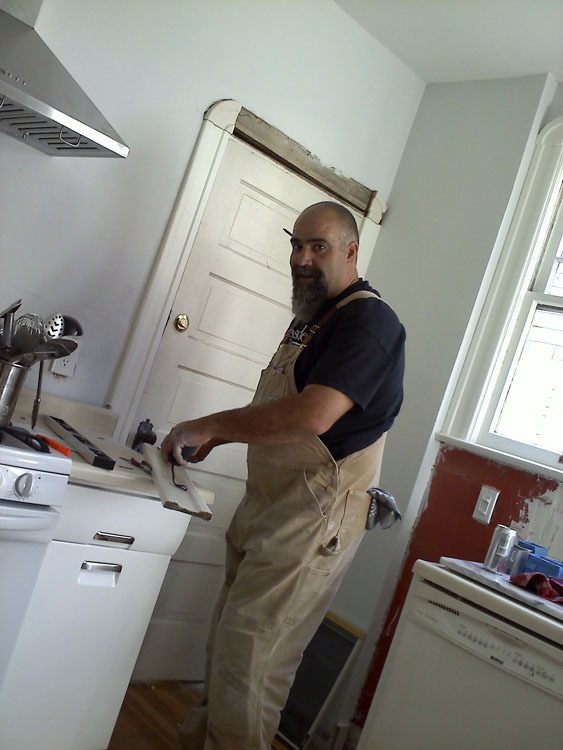 But soapstone is very expensive and not really that great for a kitchen. We looked at “green” countertops, we looked at quartz, and a million different kinds of stone. Finally we found a piece of honed Absolute Black granite with a custom edge at Colorado Springs Marble and Granite. It was a piece that they had installed in some fancypants house in The Broadmoor, but three days later, were asked to remove it by the homeowner who hated it. I’m not sure what she hated about it, it was a pretty nice piece of stone. It took some fumbling around and of course went way over the original timeline, but eventually it did get installed and looked really nice! Part of the delay was our fault. We didn’t realize that the cabinets had to actually be installed before they would template. They wouldn’t template on the cabinets, then let us take them out to be powder coated. They wanted the powder coating to be done and the cabinets reinstalled before templating. We fussed around with a different powder coater who used a stripper in Denver (who wound up not being able to actually strip them for us, but couldn’t tell us that until he had them in Denver!) for a couple weeks before finding IndustrialEx (who did the stripping and the powder coating and charged 1/3rd the price). But then once the countertop people did the templating, they measured wrong and it took another eternity for them to be able to fit us in to re-template. We used Colorado Springs Marble and Granite, who had a great remnant for our kitchen project. 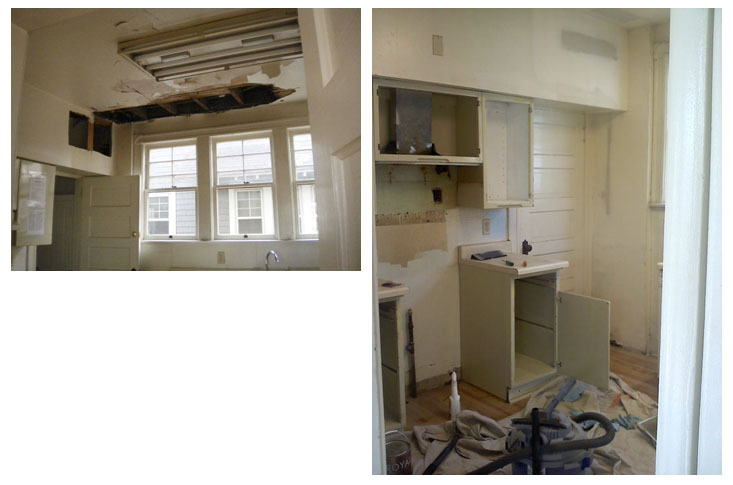 While the kitchen was all torn apart with the ordeal of the cabinets, then the endless waiting for the countertops, we patched, skim coated, and painted the walls along with getting the ceiling redone. We finally got rid of the hideous fluorescent light, which meant round two of the ceiling — we ultimately didn’t take down all the walls, just skim coated them. But the ceiling needed to be taken down and redone in a few spots. 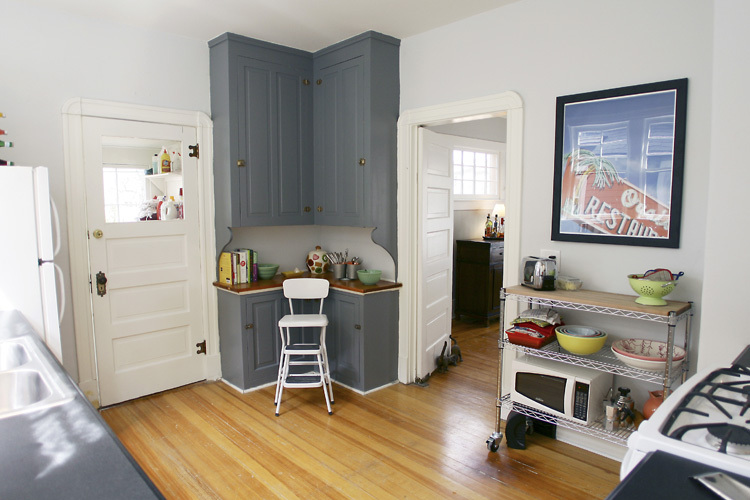 If I would have done this renovation to live in, I would have chosen a more exciting paint color. 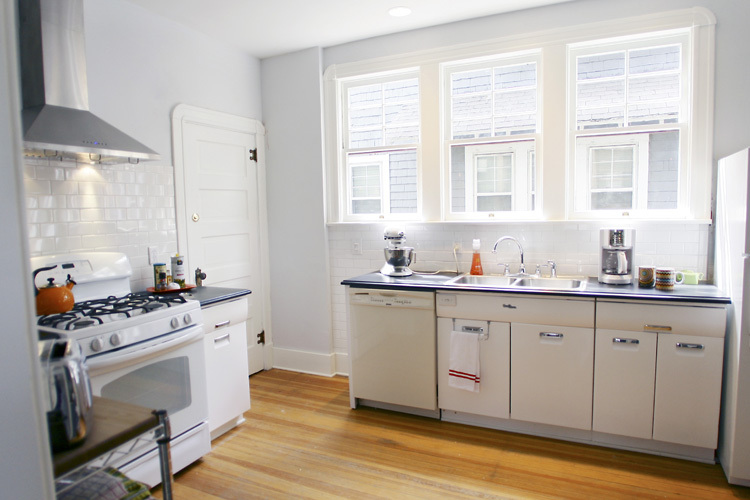 But we were doing different shades of grays throughout the house, so we continued that in the kitchen. 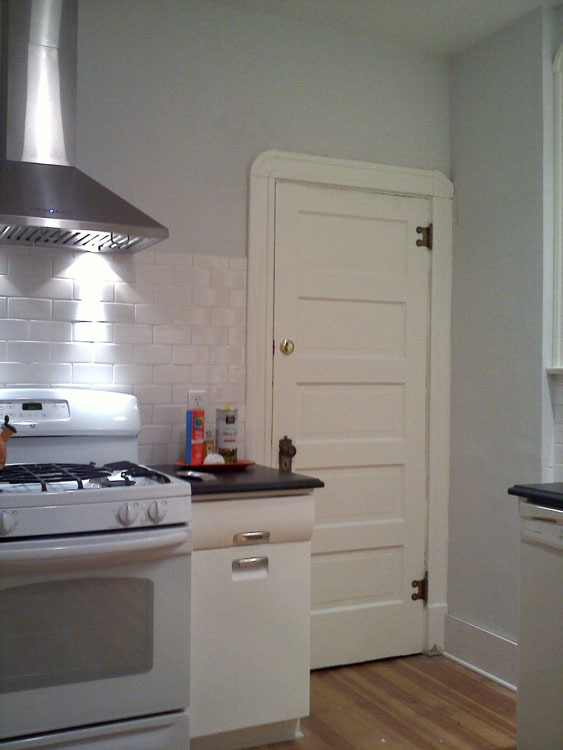 We used Benjamin Moore Genesis White. All Benjamin Moore‘s paints are low-VOC. This soffit had been menacing Mike since the day we moved in so you can imagine the glee that filled the house on this day. But oh no! What's this!? The electricians used the soffit to run the wires for the recessed lighting! 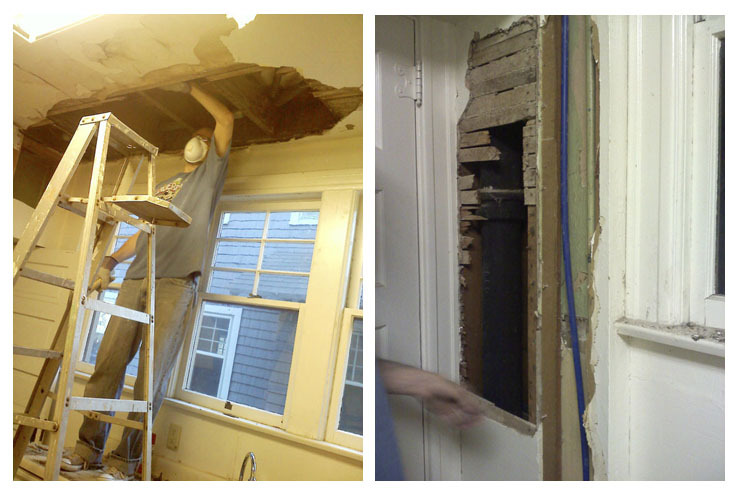 And as we feared, the soffit installers from long ago removed part of the molding- gone forever. A quick Google search and a couple of YouTube videos later and Mike managed to replace the whole wire so that it went through the wall instead. Initially, we figured we’d just splice in a length of wire to run it behind the wall, but that isn’t up to safety codes, apparently. So the whole wire had to be replaced. 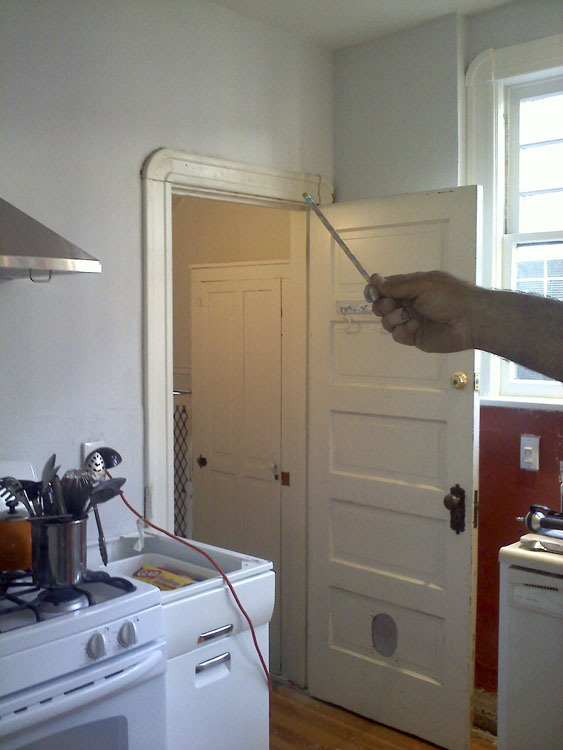 He also fixed some other weird electrical things that showed up as we were prepping the area for the backsplash. I don't think this is how it's supposed to be. 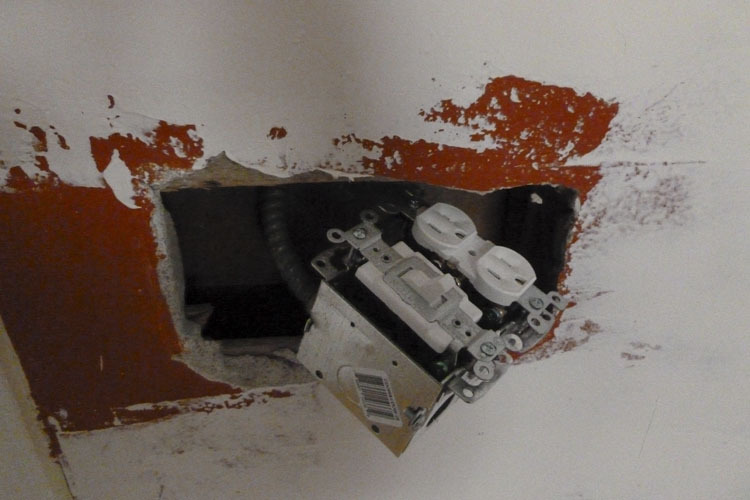 Replacing the outlets with GFCI outlets. 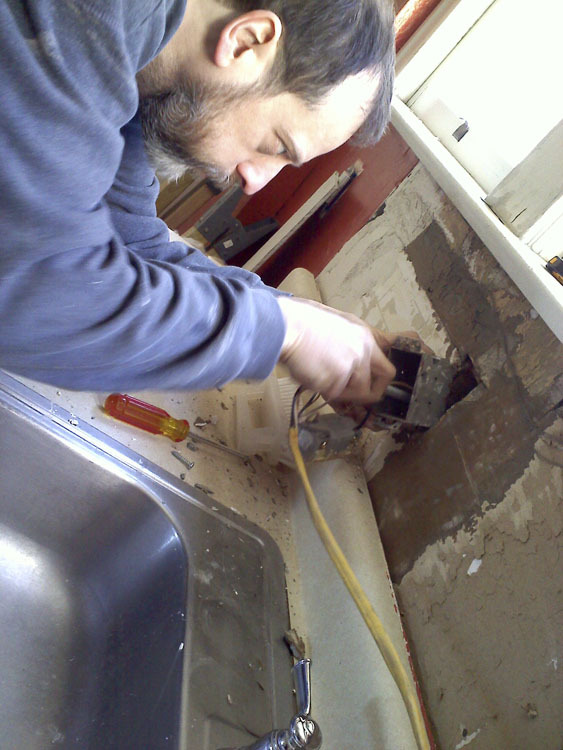 Cutting away plaster to access outlet wiring. Romex through studs instead of draped behind the backsplash. The main kitchen light also had an outlet on the same circuit but a foot away for some reason. We combined them into one fixture. 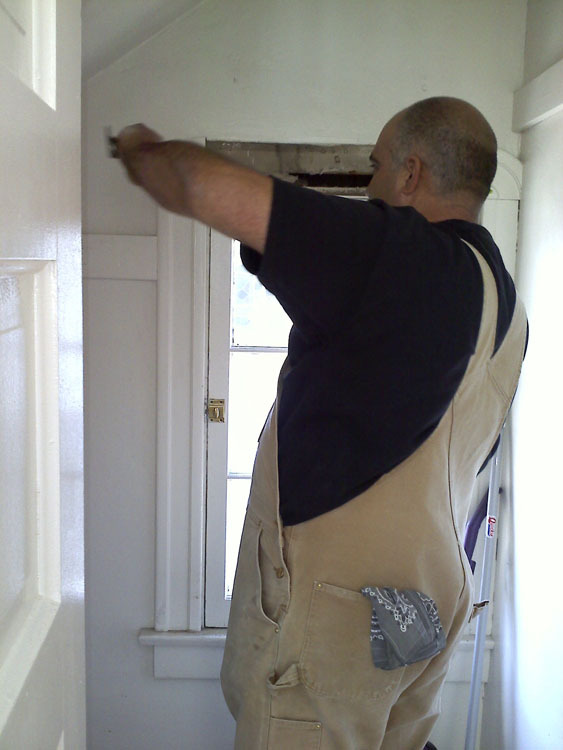 Then he spent days and nights scraping, sanding, patching, and making presentable the rest of the walls and ceiling. As much as the soffit menaced Mike, the hideous flourescent fixture menaced me. Hurrah! It's gone! Scraping, sanding, patching, skim coating all the walls was a full-time job for Mike for about a week. I provided moral support, sandwiches, and Facebook updates. There was still the matter of the hutch that we had sort of been ignoring. Someone had put some crappy, sloppy mosaic tile on it at some point, and that had to go. But what to replace it with? Our neighbor has wood on hers, so we decided to go that route. We were going to get a piece of butcher block from Ikea and cut it to fit. We started out by getting rid of the tile. 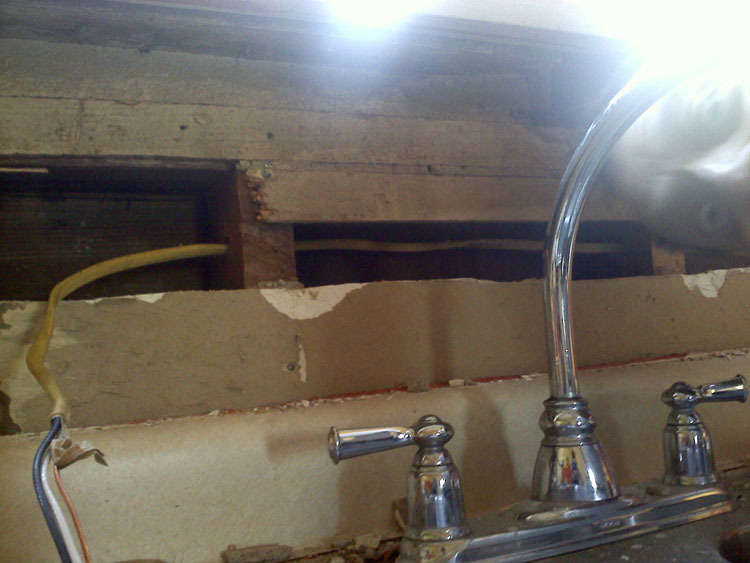 Chipping off the mosaic tile revealed the original wood countertop beneath! Glorious! Mike showing that lame tile who's boss. After Mike removed all the tile and the metal edging, I sanded and stained the wood top. He put up drywall on the back. It looked really good. That was an exciting project. 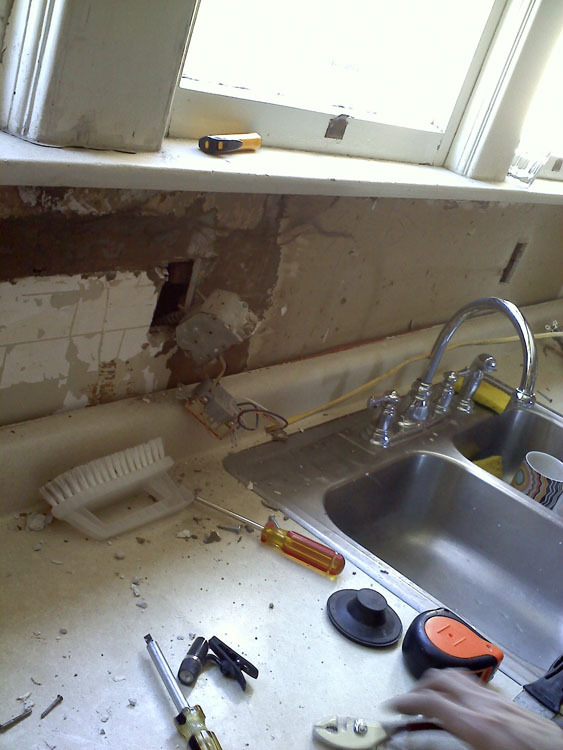 This was our kitchen for about 6 weeks. 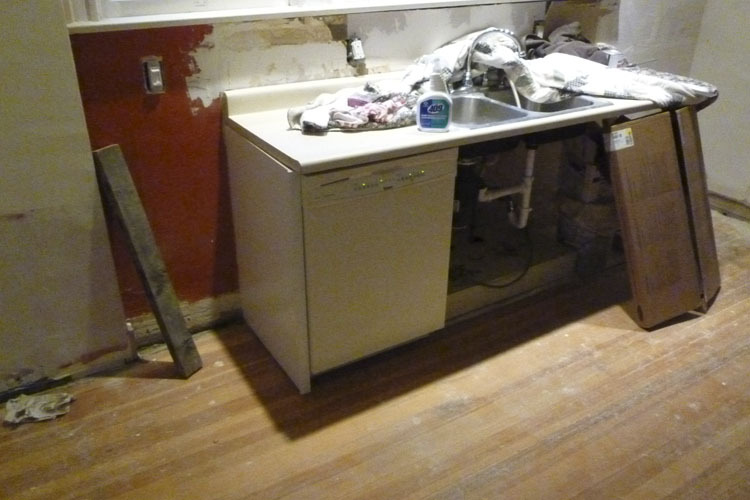 We were still waiting for the cabinets and the granite after all this, but were feeling pretty confident about how things were going on our end and all the new skills we’d learned. The cabinets were kind of carved up when they installed the dishwasher before we bought the place. So there was no side panel on it, just some lame piece of particle board duct taped to the counter. We wanted to get a real side piece and install it properly so we went to Home Depot to get one. 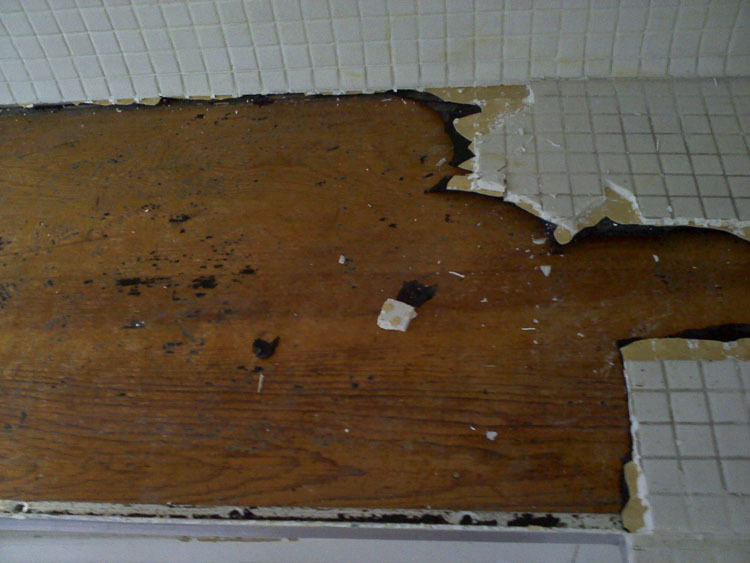 The people who owned the place before us also didn’t bother to remove the cabinets when they redid the floors so the cabinets were sitting about 1/4 inch above the rest of the floor, on top of layers of linoleum and other flooring. If we were going to live there we would have addressed this, but since we weren’t, it didn’t seem like a huge deal. Until we went to buy and install that stupid side panel. The granite people said it needed to be installed before they could install the granite, why, I have no idea. Anyhow, let’s just say that the stress of job loss, having to move from the house we just bought, months of having the kitchen torn up, trial and error of what seemed like the simplest projects, along with the general pain in the buttness and draining wallet of remodeling caused a huge meltdown in the cabinet aisle of the Home Depot over the $35 dishwasher side panel that was 1/4 inch too short. That’s when we decided to call in the Big Guns. I have no doubt that we could have finished this kitchen project by ourselves if we wouldn’t have been under such a time constraint. But by then, it had all become a little too much for people who had never done anything like this before. We did eventually buy the stupid side panel after leaving Home Depot in a huff that first night. But it looked ridiculous when we installed it. Check out the box it came in, just sitting there mocking us. The "Big Guns." My contractor brother Brian came out to help for a few days. Address that stupid dishwasher side panel! The vent hood is installed. 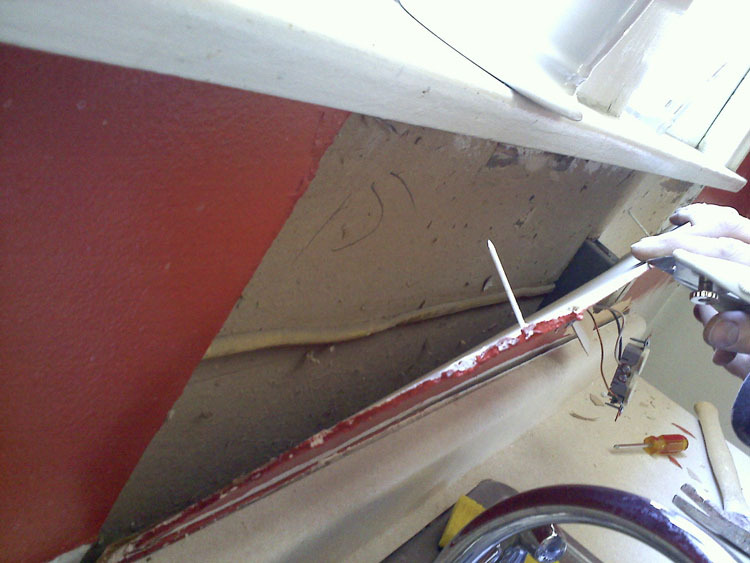 Salvaging the trim molding from a closet window (lucky that was available!) to use in the kitchen. Replaced with new plain molding. And installing it in the kitchen. Lookin' good! This pencil pic is for Sandy Ward. Enjoy, Sandy! Brian finished fitting it in and added some missing parts by using Bondo, and the missing molding piece was done. Like it was never missing! Later, Mike repaired the weird hole in the door. The rest of the projects, along with a few other random things for the rest of the house and we really were almost done. We were so happy with the powder coating on the cabinets that we got all the heater vents done, too. Here's one of them before. 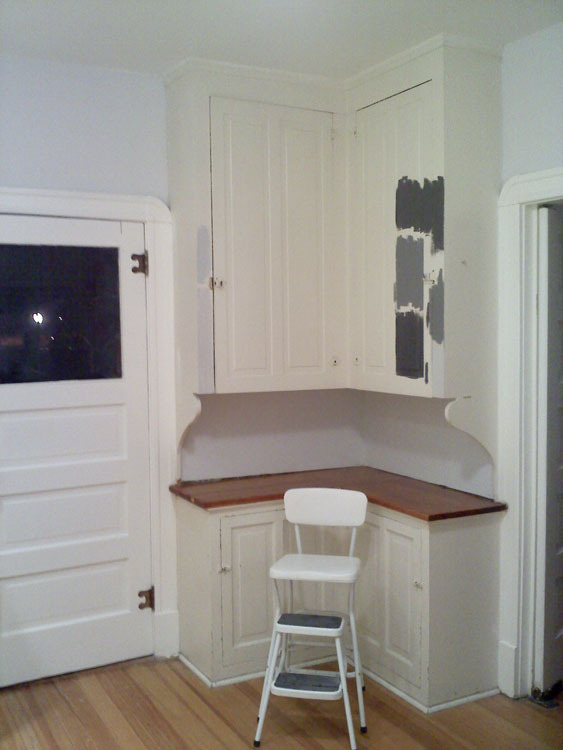 We painted the hutch with Benjamin Moore, but I can't remember what color! 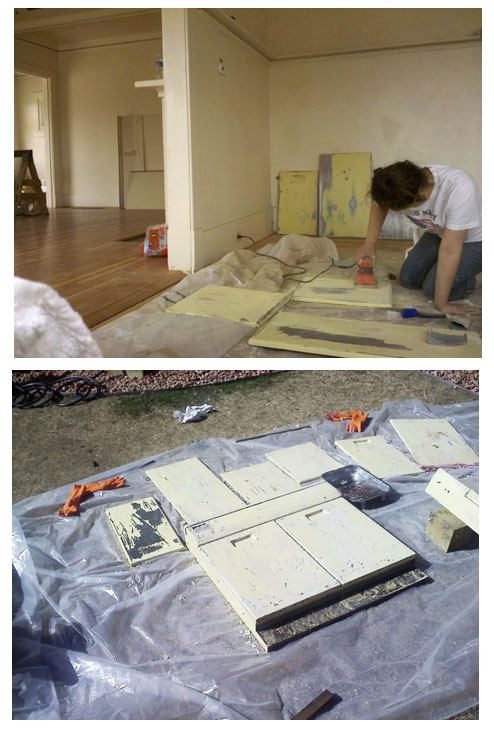 We also stripped all the old paint off the hardware on the hutch and all the hinges and door knobs throughout. We kept our secondhand fridge because it was in good condition. It was just missing its kickplate which I tracked down online. I bought a cute overhead light fixture for $5 at Habitat For Humanity Restore. 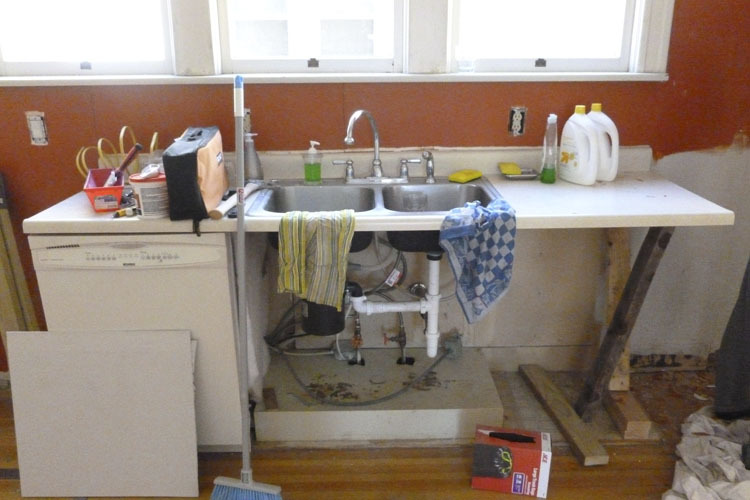 We kept the sink and faucet, which just needed to be scrubbed and polished. Finally the countertops were installed. I was happy with how the granite came out. So the very last thing we needed was to have our favorite tile guy, Tim, come do the subway tile. I like subway tile, but the main reason we chose it here is because we had a bunch of it left over from the bathroom project. We got a new metro shelf that fit properly in the space by the main door. Added some artwork, and brought back in just some of my favorite kitchen stuff, and stored the rest of it to keep the space clutter free. Although I would probably do a few things differently now, overall we were really happy with how it came out. So I guess we were pretty much able to do it very close to the $4,000 we originally had.